With his dream debut for LA Galaxy, it’s difficult to stop hearing about David Beckham at the moment. 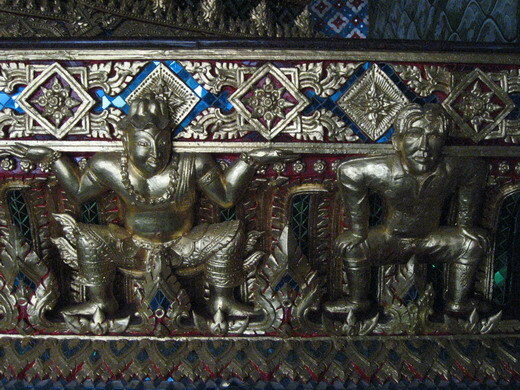 But after writing about it a few weeks ago, I decided I wanted to see the golden statue of David Beckham at Wat Pariwas for myself and get some pictures and video, both of which you can find below. I hunted around online but surprisingly couldn’t find any info as to the location of the temple itself. 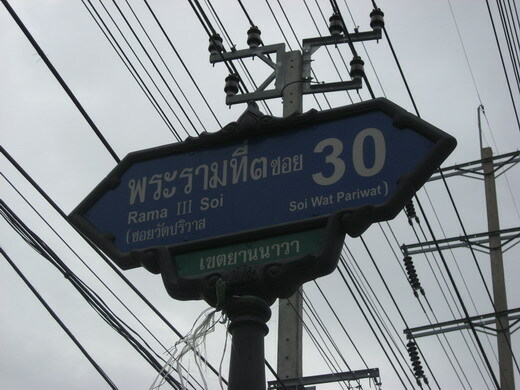 So, here you go: the address is Wat Pariwas, 2-67 Rama III Road, Bangkok. The easiest way to get there is take the BTS Skytrain to Chong Nonsi station, and then get a taxi cab from there. It helps if you’ve got the address written down in English and in Thai, if you’re feeling super efficient. A bunch of helpful motorbike taxi drivers hanging around at the BTS station helped us flag down a taxi and explained where we wanted to go. 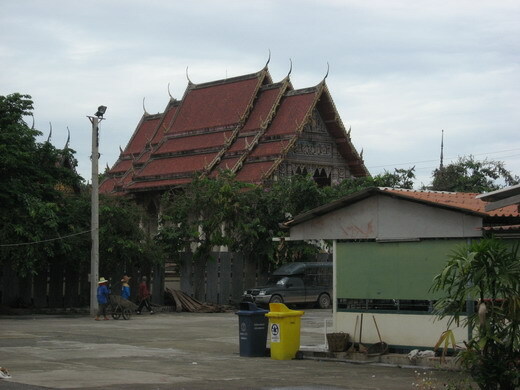 It was about a 10 – 15 minute drive from the station, and the temple is right on the Chao Praya river within Chinatown. When the taxi driver dropped us off, we found ourselves standing on the side of a very busy road at the entrance to the wat. A long driveway headed into the temple grounds, which we could see immediately. It was a huge, old building in the classic, stunning Thai style with a roof that looked like it was flying – but as we got nearer,we realised this temple, clearly very old, was in a state of near collapse. There were a lot of bemused but friendly construction workers milling around, who pointed us further up the road. I began to wonder if we were in the right place. Around the bend we found a whole new temple complex that had been built very recently, given the gleaming paintwork everywhere. There were cats and dogs everywhere, and very few people about – I’d been wondering if the David Beckham temple would be a tourist circus but there was barely a soul around. After a bit of wandering around we realised the huge, nondescript looking modern building that we thought was part of the school next door was actually the new temple. 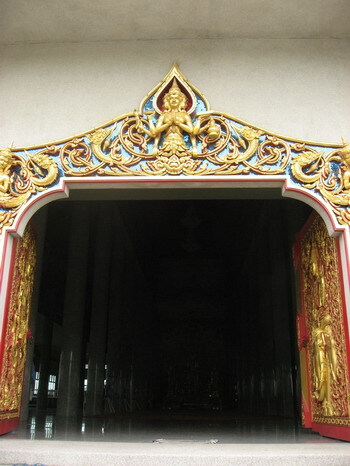 I’d never seen a Thai temple like this before – it was on the second floor of the building up a big staircase, and the only thing that gave it away was the ornate carvings on its huge doors. Huge doors that were locked. Rats. Luckily the gatekeeper materialised out of nowhere and without speaking a word of English, gave us a big smile as he knew exactly what we were doing there. Once he swung open the temple doors, we were somewhat taken aback about how big the interior was. It reminded me of a cathedral with its long walk down to the altar and the tall ceiling held by pillars leading down to it, complete with red carpet. Intricate murals ran along the top of the pillars, far above the eye level of even the tallest worshipper. 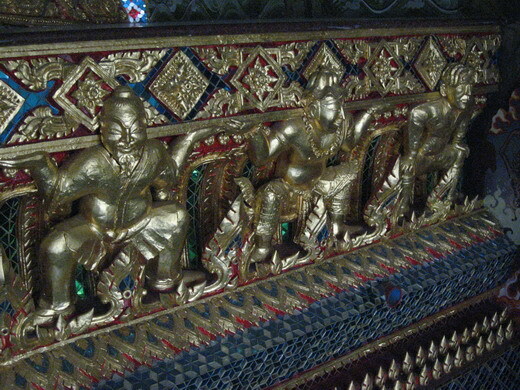 The shrine itself is a riot of gold, with three large Buddha figures in front of another incredibly intricate mural. 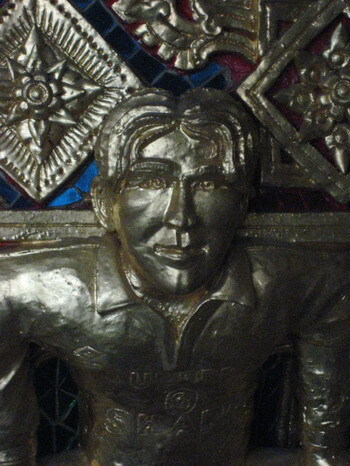 If you didn’t know it was here, you wouldn’t necessarily spot the David Beckham statue, because rather than being a free-standing sculpture like those of the Buddha, Beckham’s image is actually carved into the altar itself. 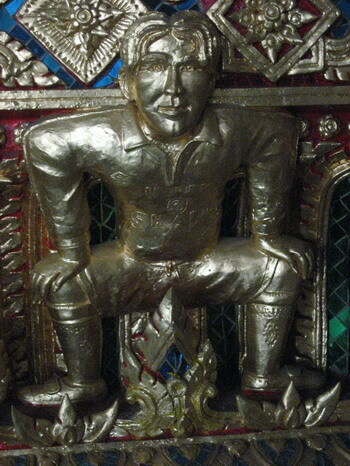 Beckham is depicted in the style of a garuda holding up the altar itself oo his shoulders – the garuda are guardian demons, and a string of them are carved into each side of the altar, with Beckham as the last of them on the right side of the altar as you face it. We had no problems finding it thanks to the gatekeeper accompanying us to the altar to point it out for us. The statue itself is definitely Beckham, sporting his floppy haircut from nearly a decade ago and even with the sponsorship logo Sharp picked out on his chest. It’s about half a metre high. As I wrote in my previous story about the David Beckham temple, the statue was installed at the temple in 1998 as part of the World Cup celebrations by Thai sculptor Thongruang Haemhod. According to this BBC News story, Thongruang wanted to add it because football is the new religion, and the temple’s abbot agreed. Thailand is always full of surprises, and even though I’d seen the photos, it still made me grin to see the David Beckham statue in real life. I would dearly love to see what he and Posh would make of this temple in the backwaters of Bangkok – maybe they’ve already been, given Beckham’s several visits to Bangkok for football and sponsorship duties.